Zones allow companies to specify coverage areas as well as specific pricing based on a ride's start location. 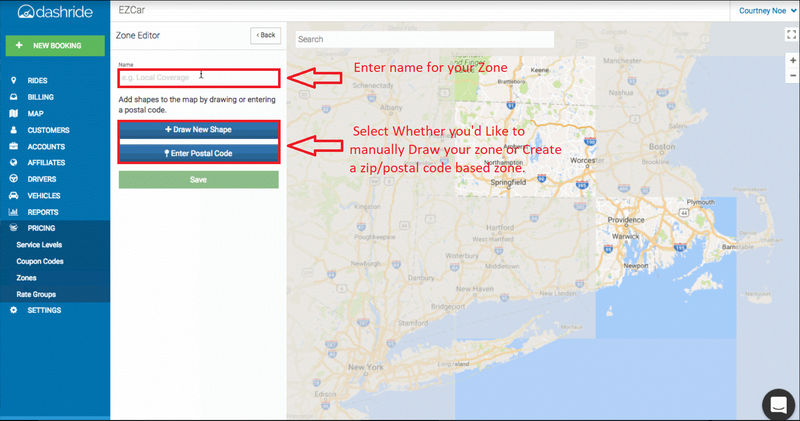 To use this feature, you need to first draw your zones, and then edit your service types to choose its coverage zone. If you want to only have a service type available in a specific geographic area, you can create that area as a zone, and only show that service if the customer is in that zone. You can also set different pricing per zone. 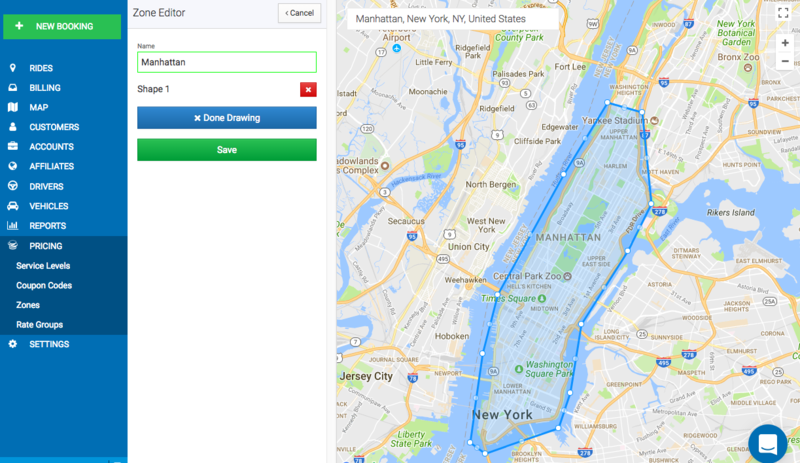 For example, if you offer a black car service for $2/mile in Manhattan, and $3/mile in Brooklyn, you can create a Manhattan and Brooklyn service with their individual pricing, and the prices would automatically change based on the customer location. You can create zones in the dispatching center by going to 'Pricing' > 'Zones' from the left menu. In the Zones screen, you can click 'Add Zone' to start drawing your zone. You should then name your zone and start drawing regions. If you choose to Draw your own zone, click on "Draw New Shape" Then you can start clicking on the map to draw you area. When you are finished drawing, click the 'Done drawing' button. You can draw multiple shapes at a time, and each of these is considered a 'Shape'. See the screenshot below for details. 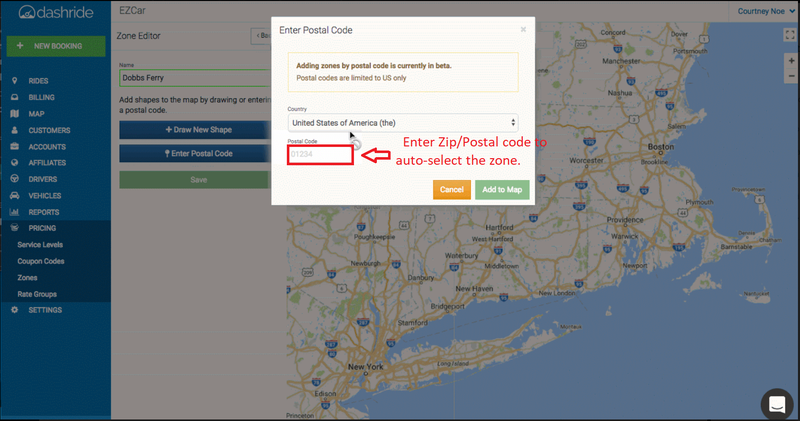 if you choose to go the zip/postal Code route, Click on "Enter Postal Code", it'll pop up a small window that'll let you select the country in which the zone resides, and then enter the postal code, Once entered Click on "Add to Map" And the zone will be auto-highlighted. When you are done drawing and editing your zone, click 'Done Drawing' and then click 'Save'. Once you have created your zones, you'll need to apply them to your service types. To do so, go to 'Settings' > 'Pricing', and edit the service type for which you'd like to set the zone. Under the section 'Coverage zone', you can select your zone from this dropdown list. When you have successfully set the coverage zone of your service type, open up your customer app or website and try to schedule a ride. You will only see your update service type if the start location is within this zone.